The present panel was in the Dreyfus collection Paris and entered the Thyssen-Bornemisza collection in 1931. It is first mentioned in the literature in 1937 where it is attributed to the Florentine painter Francesco Botticini, an attribution first made by Tancred Borenius in 1931. Botticini was the son of an artisan painter with whom he may have first trained, followed by a period in the workshop of Neri di Bicci in 1459 where he remained for less than a year. It is thought that Botticini was established as an independent master around 1469 with his own workshop. His style reflects a wide variety of influences from Andrea del Castagno to Andrea del Verrocchio and Sandro Botticelli, a fact that has made it difficult to organise the catalogue of his oeuvre. Among his most outstanding works are the panel in the Uffizi of the three Archangels, and the Tabernacle of the Sacrament in the Museo Diocesano in Empoli, commissioned for the high altar of the city’s collegiate church in 1484 and completed by his son Raffaello. The present small panel depicts the two married saints Cecilia and Valerian, who are about to be crowned with roses and lilies by a small angel. The life of Saint Cecilia, who was patron saint of music from the late 15th century onwards and is consequently represented after that date with a musical instrument, is recounted in The Golden Legend. From a noble Roman family, she was educated in the Christian faith and always carried the Gospels with her. Saint Cecilia was betrothed to Saint Valerian, whom she converted to Christianity and who became her husband. One day, on returning home from his baptism, Valerian found his wife talking to an angel that held two crowns of roses and lilies, which it gave to the couple. 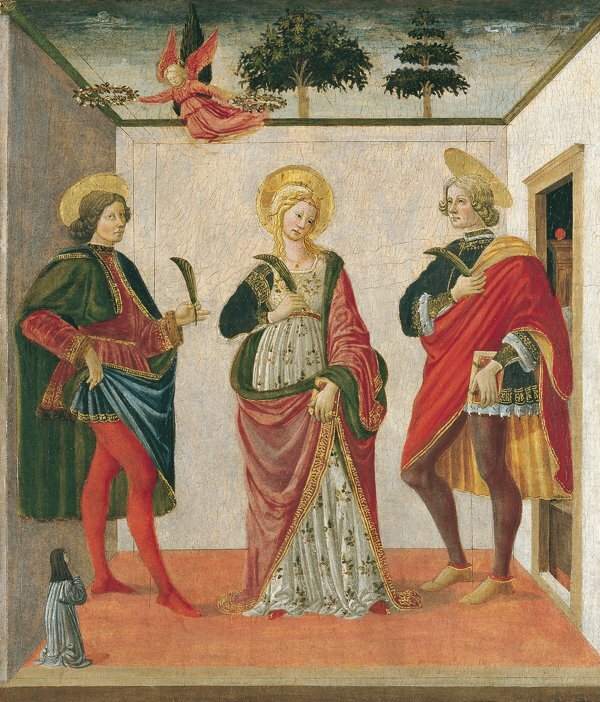 The third figure in the composition is Saint Tiburtius, brother of Saint Valerian, who was converted toChristianity by his brother and Cecilia. According to The Golden Legend, the brothers were martyred by the prefect Almachius, as was Saint Cecilia. Botticini locates the composition in an exterior setting in a cube-shaped, walled courtyard next to the bedroom. The elegantly posed figures have few attributes, only the martyr’s palm and in the case of Cecilia a book that might be the Gospels. Kneeling on the floor of the courtyard on the left is a small praying figure whose exaggeratedly diminished scale prevents it from being fully integrated into the composition. The painting has been compared to two works of the early 1470s to which it is stylistically similar.4 These are The Virgin enthroned with four Saints of 1471 (Musée Jacquemart-André, Paris), in which the figure of Saint Pancratius is similar to that of Valerian; and Saint Monica with Augustinian Nuns, also of 1471, in Santo Spirito, Florence, in which the donor figure in the present panel is similar to the young nuns kneeling next to Saint Monica.